Enlarged 7" x 12" versions of pictures/spellings from Books. Set contains 50 cards that go with the songs. 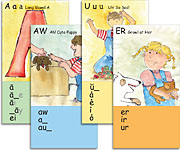 Perfect for use in a classroom along with the Phonics By Spelling books and musical CDs. Children, parents, and teachers use them as a quick reference for the spelling/sound connection.